Perhaps no one more than the poet, Ted Hughes, vested meaning and metaphor in the crow. For me, crows have been the source of childhood memories and are as beautiful and mysterious as black rainbows. Tender and cruel and brilliant, they carry their own shadow. Yesterday (March 20) I saw a good dozen in singles and pairs returning to Squire Valleevue Farm. By the end of the month small flocks will arrive to begin the mating and battle rituals. And by the first of May nests will fill with black rainbows. 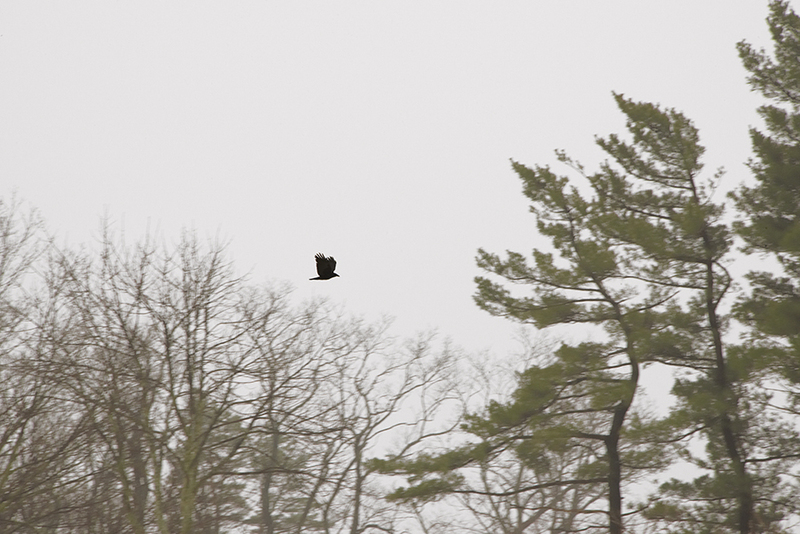 The lone crow (above) did not hesitate against strong headwinds, coming to rest in the swaying white pines, twisted and reaching, entreating in welcome, reminiscent of a Kona painting.